Do shared values make friendships more valuable? How is it that most of us feel like we are generally good people, but yet we can actually all have such differing viewpoints on what constitutes good values? And how do differences in values affect our friendships? Without a lofty degree in some sociology or something, I am probably not really qualified to answer that question, however, I would like to explore the concept from my own perspective…. I have a wide variety of friends, most of whom I would say are essentially good people at their core, despite the fact that we do not value the same things in this life. Some of my friend’s value money and status, while others value veganism or living a green lifestyle. I can’t say I value either of these things fiercely, and yet it does not impact our friendship particularly. I have mentioned this several times, but in case you are just tuning in, I also do not identify as heterosexual. I have one friend who is very religious and did not vote in favour of marriage equality. Surely it would seem strange that this difference in values would not impact our friendship? Yet it does not. Why do I think this is? Because my friends and I do not push our values onto one another. We respect everyone has a right to live their life their own way and strive to see the best in each other. At its core, I feel we all value the things that matter; love, kindness and respect. As long as we show these things to one another the rest shouldn’t be as relevant. Our differences just make us more special. That said, there has definitely been times when differences in values have changed or damaged the friendships. Clearly, I value friendships and make conscious time and effort to maintain them…. Yet I have friends who have demonstrated that they value romantic relationships and family above all else and disappear into these when the circumstances permit. Once I accept this about certain friends, I can keep my expectations of them and our friendship, in check, and try and maintain closer bonds with people more likely to show up for me even when they are loved up. In other circumstances I have inadvertently condoned situations that didn’t involve me, merely by continuing friendships with people who didn’t share some core values like honesty in their other relationships. Although I always encouraged honesty and respect, by not forcing my values onto them and the way they lived their lives, they felt comfortable in putting me in positions that encouraged me to participate in their dishonesty. Our difference in values only became a problem when they wanted me to compromise my own. Then it became a deal breaker. At other times, I may have had reservations about people based on what I perceive their values to be. This may have been because I witnessed them being rude to wait staff, or it may have been because of gossip other people have shared with me. Regardless, I usually choose to get to know someone and test our compatibility based on my own experiences of them. Making a snap judgement based on one incident, which probably does not represent their best and true character, or listening to hearsay is the nemesis of connection. That’s not to say I have never been burned because I didn’t listen to these warnings. I have indeed had to learn the hard way that someone was the bully that everyone warned me about, or that rudeness and a sense of entitlement did exist in a person, and the witnessed behaviour was not a once off 'bad day' kinda thing. Of course I have also been rewarded and pleasantly surprised by others who based on my experiences of them were wonderful people, even if the majority did not agree. The thing I try hardest to value in my being, is not to judge people. Not to jump to harsh conclusions about who they are and if they are right or wrong. I try to encourage people, see the best in them, and enjoy them so long as I am not in a position of compromising my own values, I show curiosity about theirs. I try to let go of the notion that someone is better or worse, based on their values or lifestyle, and instead, see if they add value and happiness to my life, based on my own experiences of them. 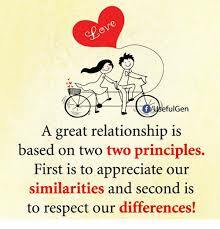 No 2 people will have exactly the same chemistry or bring out exactly the same characteristics. If a friendship adds value to my life, then it is valuable, regardless of if we value the same things or not. Our differences make it interesting. We have much to learn from each other, if we show openness and curiosity instead of judgement and fear. How have valued impacted your friendships? Newer PostStages of Grief; HOW IT FEELS.